Make the most of your credit, it's totally free! Start by digging into your credit profile and finding out what goes into your credit scores. Then get important updates with credit monitoring, check out personalized recommendations, even file your taxes for free with Credit Karma Tax®.• Check your scores – Log in anytime to look, it will never hurt your scores.• Credit Karma Tax® – Filing your 2018 State and Federal tax return is 100% free start to finish, plus get our maximum refund guarantee, audit defense and dedicated support.• Spot potential ID theft – We’ll tell you when your info is in another company’s public data breach — and what you can do.• Find $ that belongs to you – Search state databases for unclaimed money in your name. There’s over $40 billion waiting to be claimed!• Get money-saving recommendations – Use your credit to qualify for lower interest rates and better credit card rewards.• Monitor your reports – Get alerted when there’s an important change to your reports and challenge errors right from your account.• Review credit tips – Receive helpful recommendations matched to your profile.Join more than 80 million members on the path to financial progress. 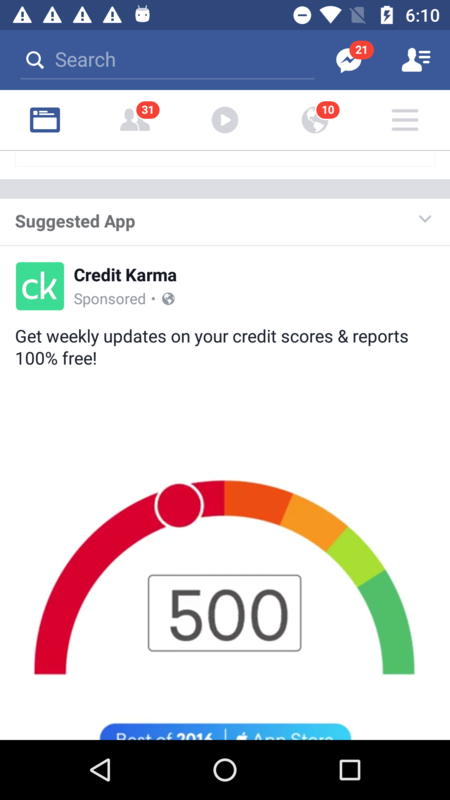 Learn more and sign up at www.creditkarma.com.